Prince Harry and Meghan Markle are going to be parents! The couple recently announced that they are expecting their first child, but just how big of a family do they want? While Harry's brother Prince William has three children of his own, it seems like Harry is content with a smaller family. During their two-day visit to Ireland back in July, the pair commented on how many kids they would want. 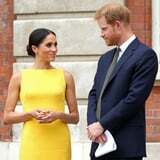 As the couple greeted the crowd, a cheeky fan named Elaine Adam-Stewart quipped, "My husband also has red hair, and he gave me five children - when are you and Meghan going to get going?" Of course, Harry was a good sport about the whole thing, saying, "Five children? Too many!" One thing is for sure: Meghan and Harry will be great parents. They're so good with children! We definitely can't wait to meet their little one next Spring!